Lake Texoma and the Denison Dam. 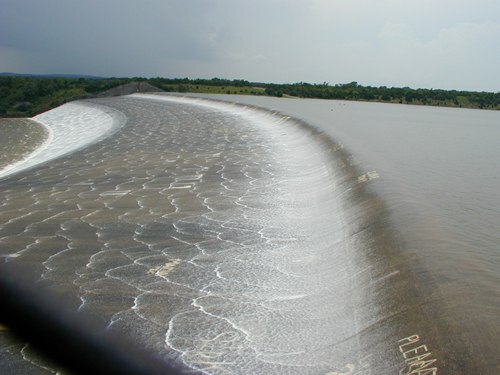 Impounding 89,000 acres of water, the dam itself is a mere five miles NW of Denison, Texas. It borders on the Texas counties of Cooke and Grayson and on the Oklahoma counties of Bryan, Love, Johnson and Bryan. While the lake itself is government property, it is maintained by the Tulsa District of the U.S. Army Corps of Engineers. The recreational facilities are managed by the National Park Service. The Flood Control Act of 1938 authorized construction of the dam which is a rather rare type known as a rolled-fill earth embankment. The length of the dam is 165 feet high and over 15,000 feet long. 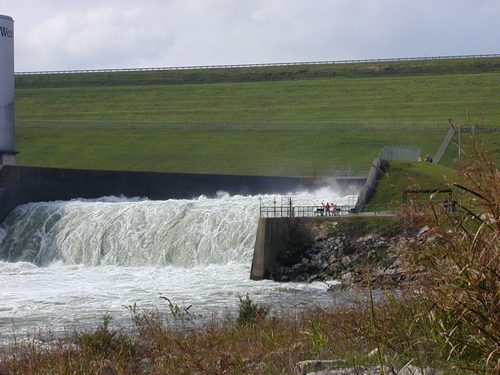 While the primary purpose of the dam is controlling floods, it also generates electrical power and the lake is an extremely popular recreational destination. Completed 1944, Texoma is today the second largest lake in Texas and the eleventh largest reservoir in capacity in the United States. Its main purposes are flood control, power generation, and recreation. Lake Texoma was promoted largely through the efforts of Sam Rayburn (1882-1961), noted speaker of the house who represented District 4 in Congress for 49 years. 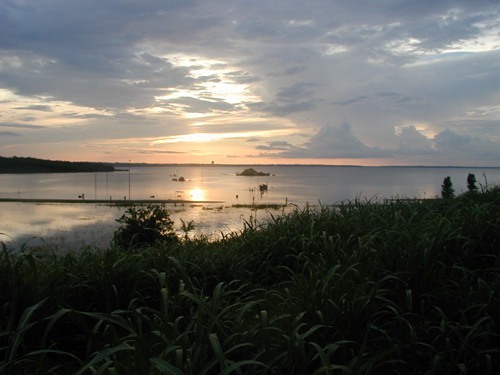 In normal operation, lake shoreline covers 550 miles, with the Red River arm (45 miles) in Texas and the Washita arm (30 miles) in Oklahoma covering 93,080 acres. The waters are impounded by Denison Dam. When Texoma was created, it caused the relocation of railroads, highways, utilities, and cemeteries. The site of Preston, historically the Red River crossing for the Butterfield Stage, was submerged, as were the sites of Hagerman and part of Cedar Mills, Texas. In 1966 numerous recreation areas on Texoma drew 8,500,000 tourists, who could also visit Eisenhower State Park at the southeast end of the lake. The park was named in honor of Dwight D. Eisenhower, the thirty-fourth president of the United States. Texoma is one of more than 200 major inland lakes and reservoirs in Texas which contribute greatly to the economic and industrial growth of the state.